US Coast Guard/Petty Officer 3rd Class Frank Iannazzo-SimmonsA US Coast Guard Station New York crew member patrols around the Statue of Liberty, May 29, 2016. 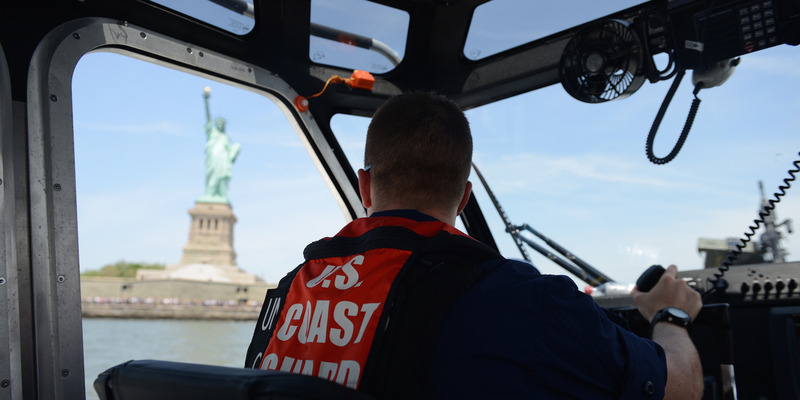 The Coast Guard has a number of resources and tactics to deal with threats on US waterways. But ISIS-inspired techniques present present a new wrinkle for the service and its maritime security teams. The US Coast Guard has a number of threats it needs to worry about when dealing with boats and their crews on US waterways, but boats without crews are adding a new wrinkle to the problem. “There is an emergence in the Middle East with ISIS of using unmanned remotely controlled vessels that are packed with explosives, and that would pose a significant challenge,” Lt. Cmdr. Devon Brennan, the commander of the Coast Guard’s Maritime Safety and Security Team in New York, said on Friday during a use-of-force demonstration. 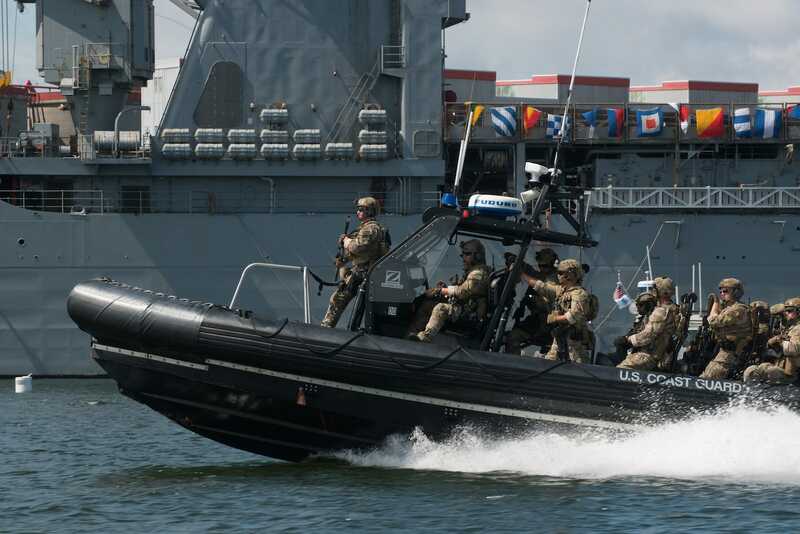 The Coast Guard’s MSSTs are tasked with security operations in US harbours and waterways. They were created in 2002, primarily to provide rapid-response anti-terrorism capability, protecting shipping, vessels, and infrastructure. 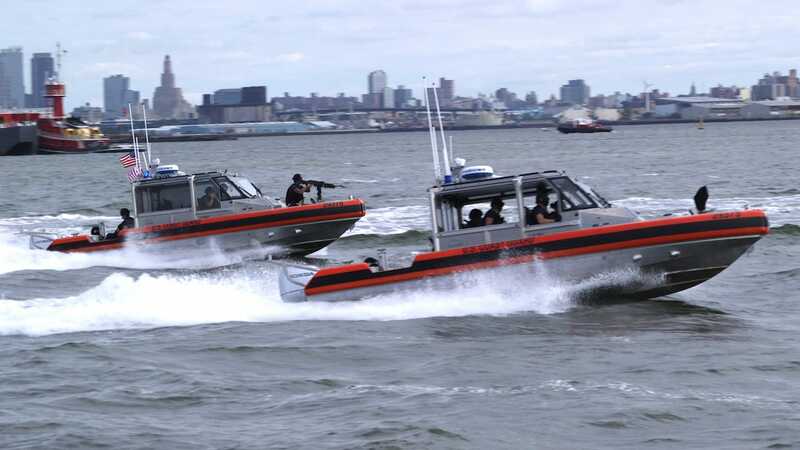 Graham Flanagan/Business InsiderCoast Guard crew members practice intercepting an unidentified vessel during a use-of-force demonstration in New York Harbour, October 5, 2018. During the demonstration, Brennan’s team practiced intercepting an unidentified vessel, gradually escalating from verbal commands to warning shots to shots to disable the vessel’s engine, using blank rounds. Unmanned vessels present something of an asymmetric threat, however. “Usually our tactics are developed around the fact that we can get an individual to stop and comply, but if it’s just a vessel that’s being remotely controlled, and that person [controlling it] obviously has no fear for their life, it creates more of a difficult situation for us,” Brennan said during an interview aboard the Coast Guard cutter Sikinak. US Coast Guard/Petty Officer 3rd Class Hunter MedleyMultiple Coast Guard crews take part in a mass-casualty drill conducted on the East River outside the UN, September 21, 2018. After sweeping over territory in Iraq and Syria in 2014, ISIS is now a greatly diminished force, though its members are reportedly regrouping and launching attacks in some parts of Iraq. In its campaigns across the Levant, ISIS made profligate use vehicle-borne improvised explosive devices – suicide car bombs – to target Iraqi forces and other opposition forces. The terror group also used small, commercially available drones equipped with small explosives or grenades. Terror groups have also used manned explosive-laden vessels to mount attacks. 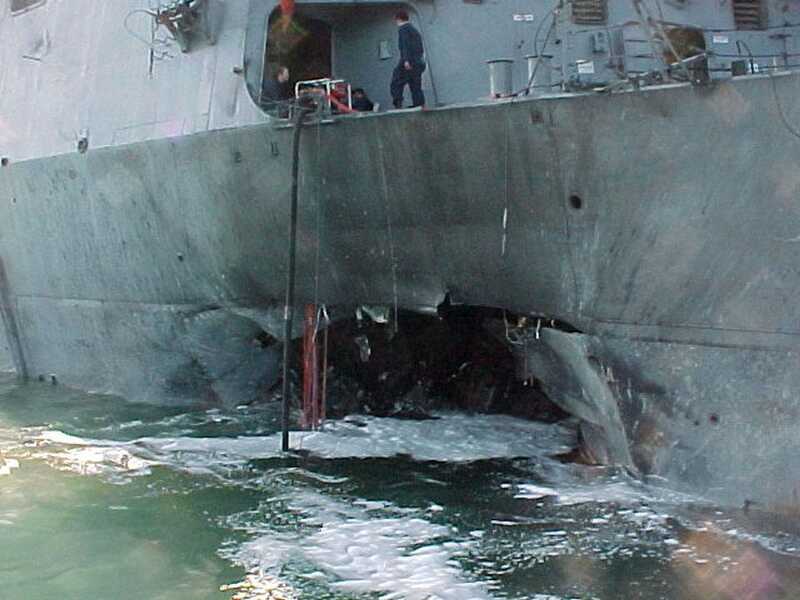 In a 2000 suicide attack attributed to Al Qaeda, a boat slammed into the side of the guided-missile destroyer USS Cole while it was refuelling in Aden, Yemen. The blast tore a hole in the ship’s hull, killing 17 sailors and wounding 39 more. US NavyUSS Cole after the attack. More recently, a small boat loaded with explosives slammed into a Saudi frigate and exploded, causing a fire, in the Mandeb Strait between the Red Sea and the Gulf of Aden. It was one of three suicide boats that attacked the ship, which was able to repel two of them, according to the Saudi Press Agency. 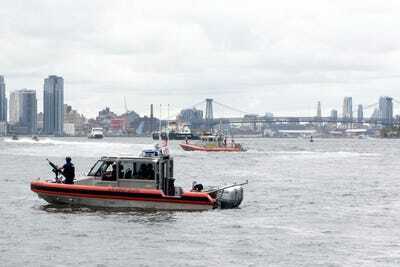 Brennan said the Coast Guard hasn’t encountered vessels posing the kind of threat seen in Friday’s demonstration. At times, he said, the service will see boaters who don’t know certain rules or under the influence of drugs or alcohol – two groups that typically comply when ordered to stop or leave an area. 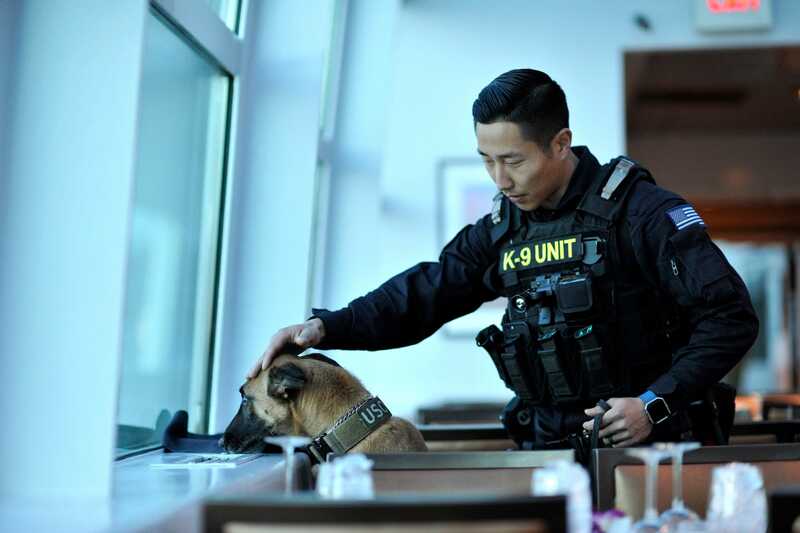 US Coast Guard/Petty Officer 2nd Class Matthew S. MasaschiA Coast Guard Maritime Safety and Security Team New York member conducts a security sweep with his canine, Ruthie, in Washington, DC, January 19, 2017. The Coast Guard is also the front line for an array of conventional threats. Container traffic has steadily grown around the world and in the US in recent years. Concerns about what was coming into US ports rose after the September 11 attacks. A decade ago, then-President George W. Bush signed a law requiring 100% screening of ships headed to the US – despite protests by shippers and even the White House itself about it being unfeasible. In 2012, the Obama administration said it had failed to meet a legal deadline to scan all containers arriving in the US for radioactive material. That requirement has been waived several times, and new challenges, like cyberattacks, have emerged. US Coast Guard/Petty Officer 3rd Class Andrew BarresiThe US Coast Guard Maritime Security Response Team patrols Boston Harbour, June 20, 2017. Picking out what shipments need scrutiny requires interagency cooperation, Brennan said. “Depending on the potential threat, where they’re coming from, and the history of that area or the shipper, we can target the ship that’s coming in,” he added. “We can put boarding teams onboard well offshore to verify cargo [and] use a range of tools” to assess chemical, biological, or radiological threats.